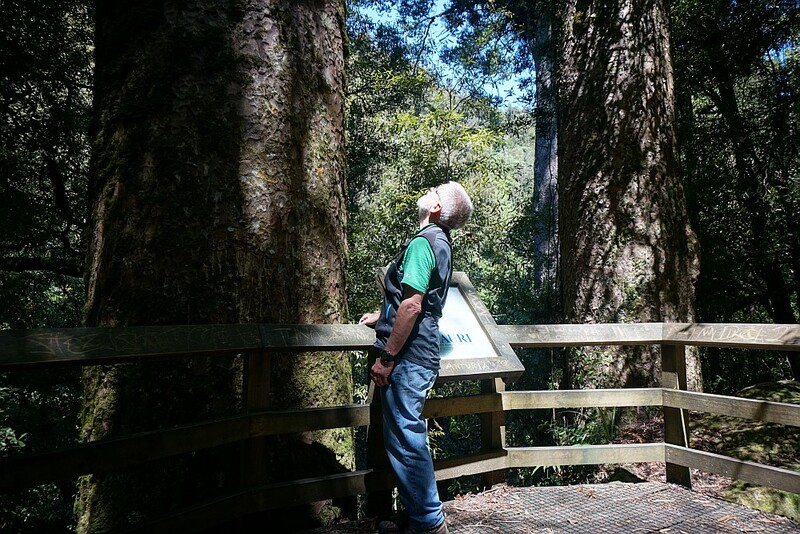 The Rapurapu Kauri Track in the Kaimai Mamaku Forest Park is accessible directly from SH29 the Waikato side of the Kaimai Range. 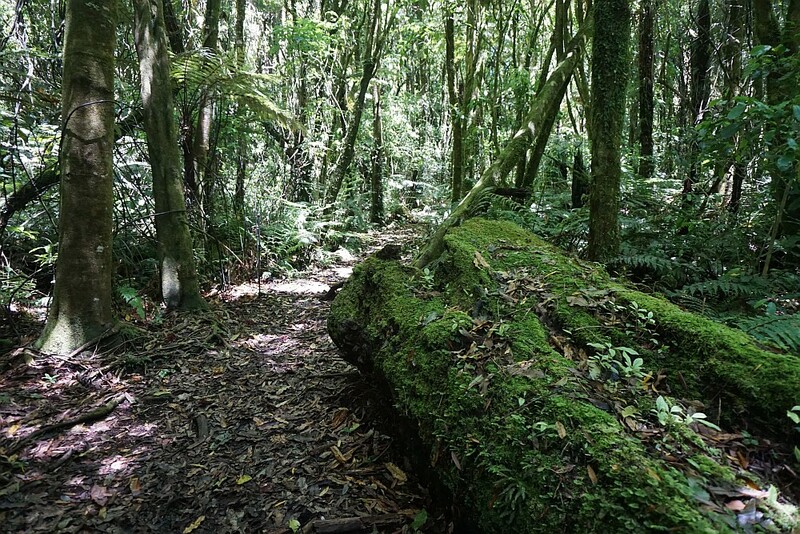 The track leads to 3 large Kauri trees near the southern limit of their natural occurrence. On the way the track crosses the Rapurapu Stream 8 times. The stream crossings may not be possible after heavy rain. The first 750 m or so of the track goes through recently cleared pine forest, before entering the regenerating native bush area in the Forest Park. The same track is used in both directions, for a total of about 6 kms, but with only about 30 m in height difference between highest and lowest points. The parking area by SH29 is small, and there are no facilities available nearby. Dogs are not allowed on the track. More information about the track can be found on the DoC web site. 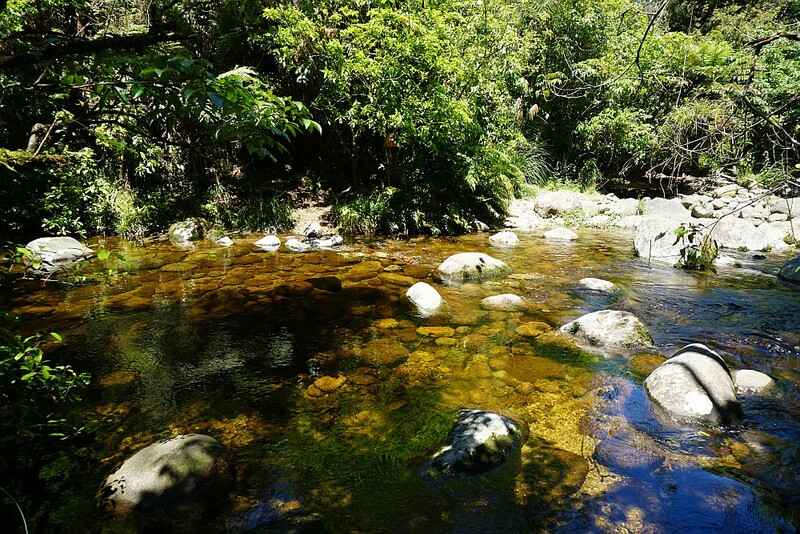 Apparently there are good swimming holes in the stream, but none of these was obvious during the walk. 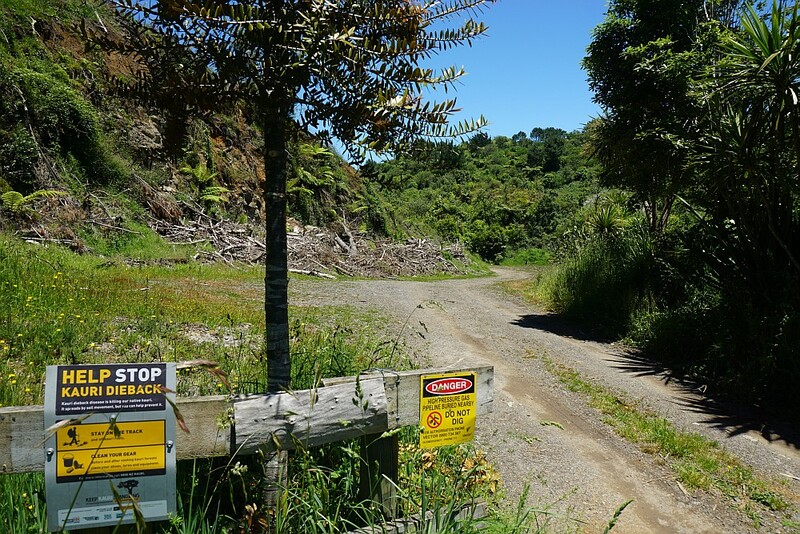 The parking area by SH29 on the Waikato side of the Kaimai Range. The start of the track through cleared pine plantation, by the parking area. A Kauri tree has been planted by the entrance. 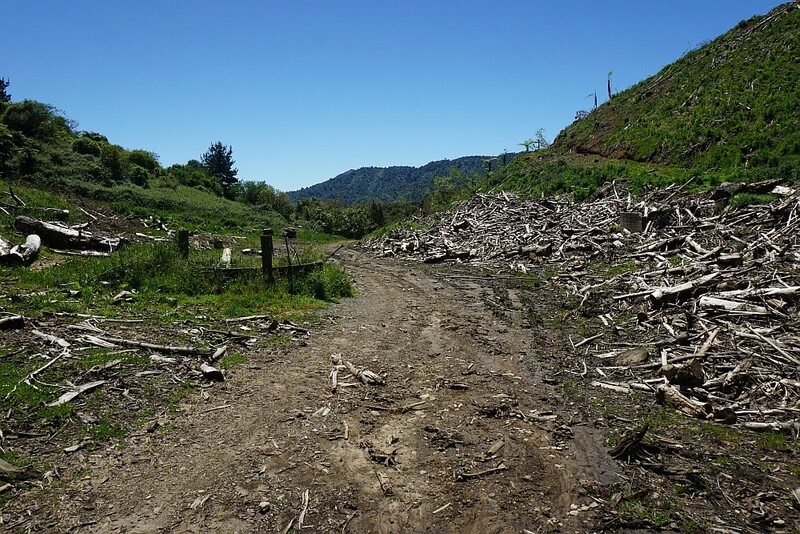 Looking back along the forest track towards SH29. 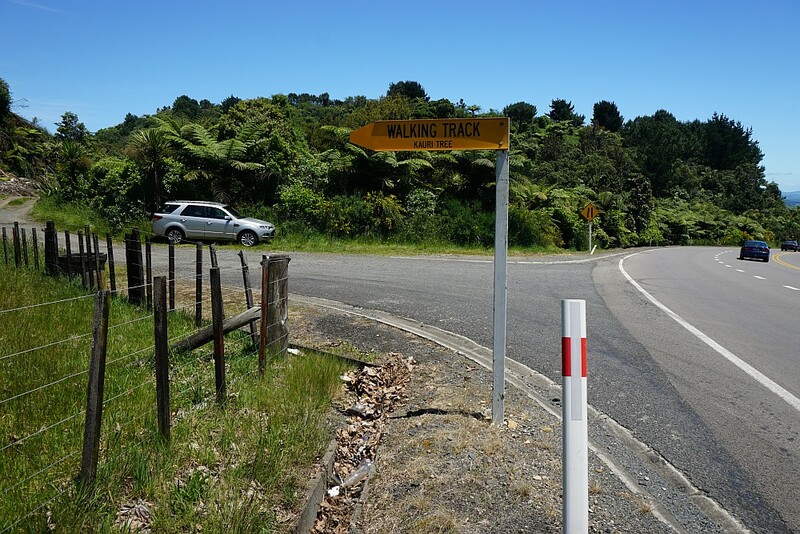 The first 750 m or so of the track consists of a single lane gravel forest road. 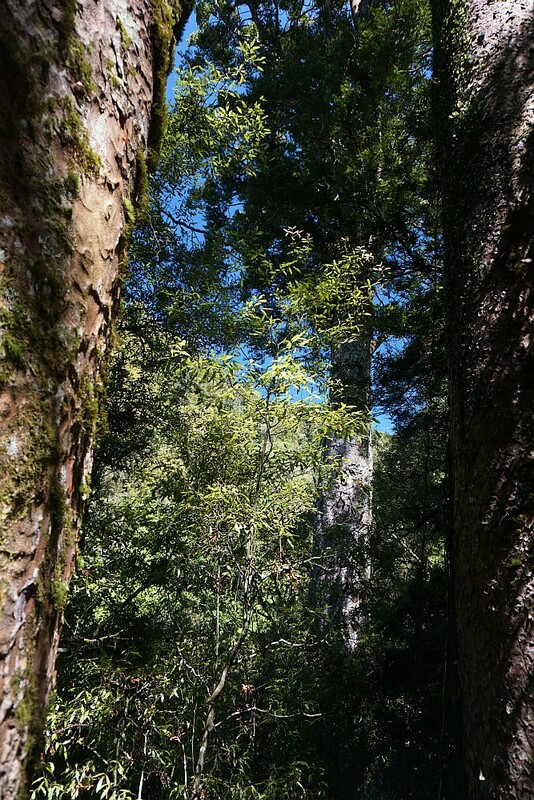 The entry point to the marked track, passing through regenerating native forest. The track has a gentle contour, with no steep sections. 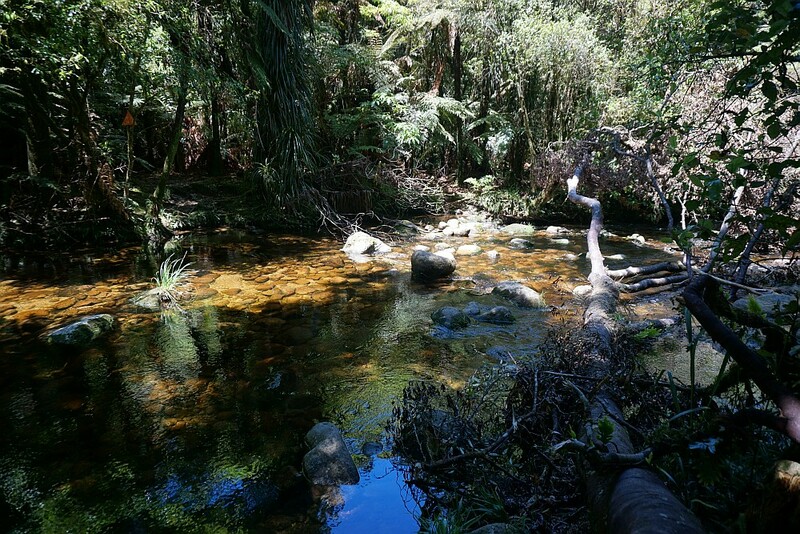 The first 750 m or so after entering the native forest is almost level, followed by a downhill section to the first stream crossing. 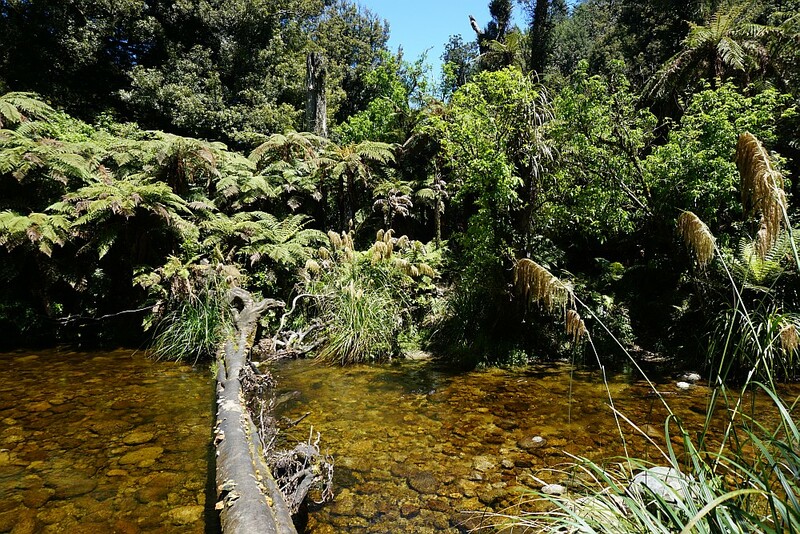 The Rapurapu Stream is crossed 8 times in each direction. This walk was done a day after about 25 mm of rain fell in the area. It was a problem on some of the crossings to avoid getting wet feet, but could be done. 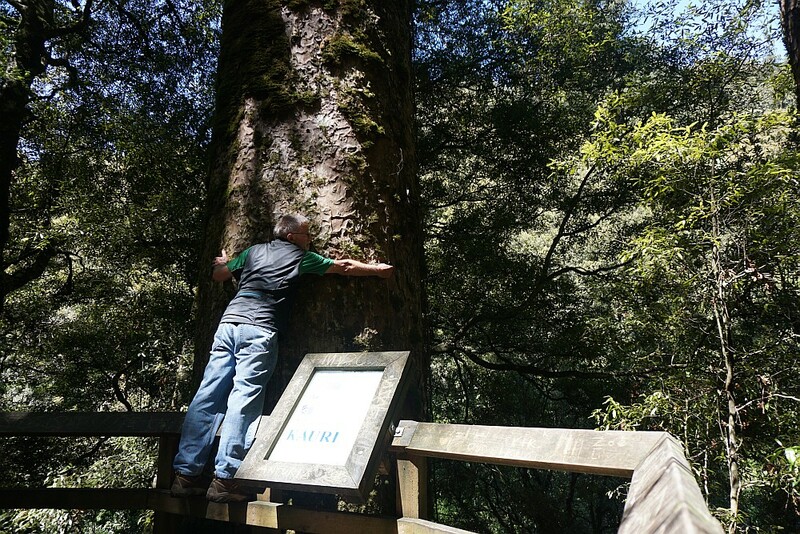 At least on the way to the Kauri trees. Luck ran out on the way back, though, with one rock giving way. At this crossing a tree had conveniently fallen across the stream, providing a suitable bridge. The stream would be easier to cross during summer. After getting wet feet the remaining crossings and the tracks between crossings were done with bare feet. 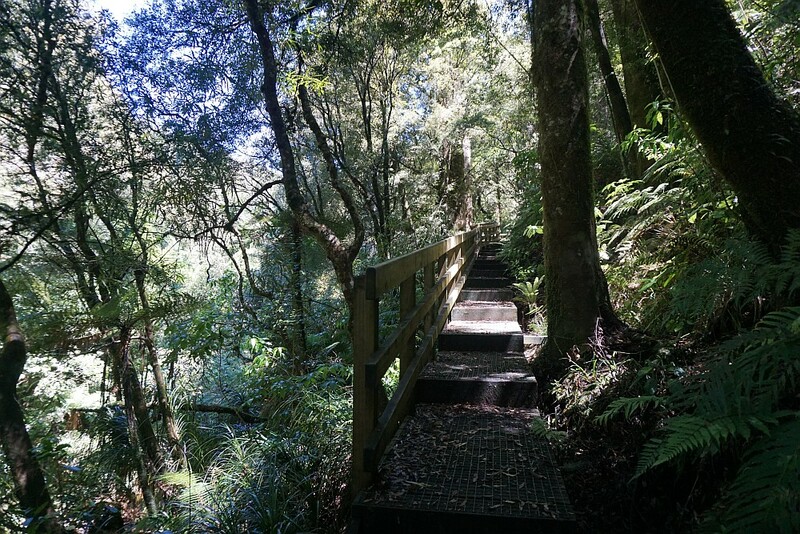 The steps leading to the viewing platform by the Kauri trees. 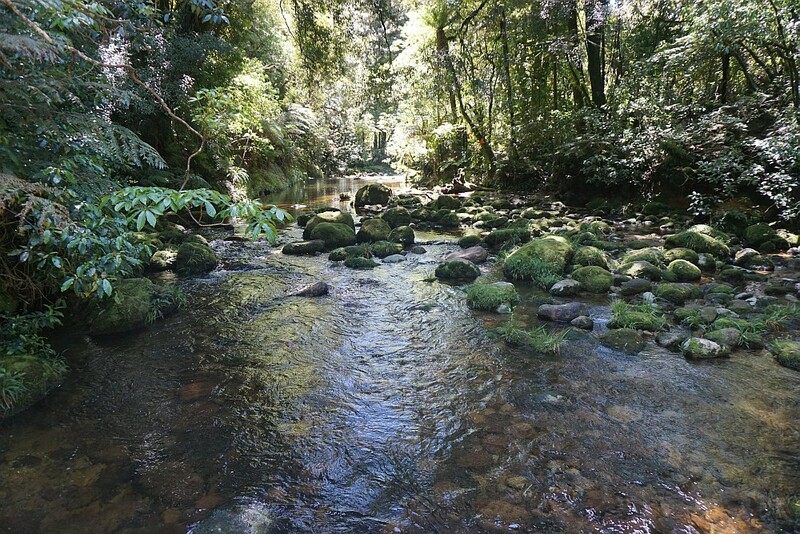 The Rapurapu Stream is in the valley immediately to the left of the stairway. 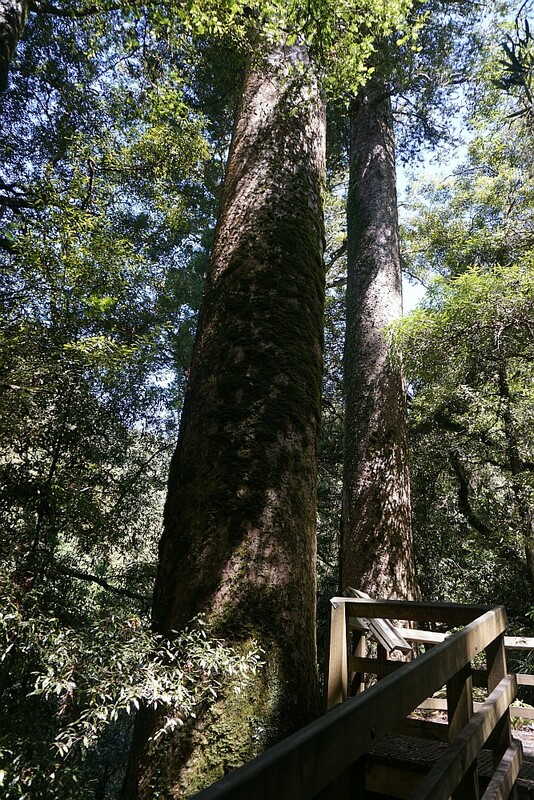 Two of the three Kauri trees in the group. The first one is the largest. The third is hidden behind these two. Estimated age is about 600 years. It’s a long way up to the first branch. The third, and smallest, tree can be seen partially hidden by the second tree. And it’s a long way around the trunk. A bit too far for a proper hug. The third tree in the group, flanked by the other two. 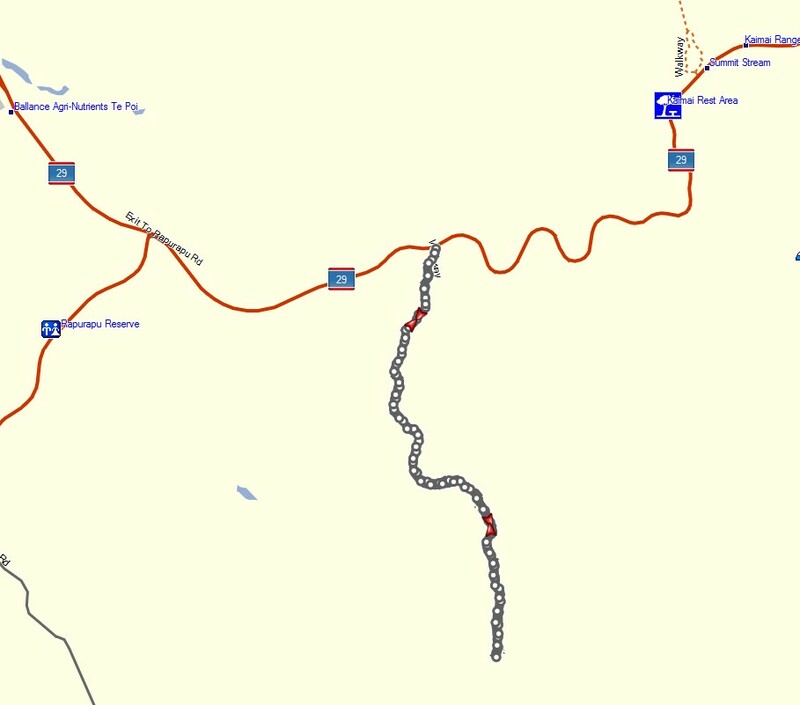 The GPS tracklog shows the route walked. Total distance about 6 kms for both directions. Walking time about 1h 10m in each direction, with a total time of 2h 30m. 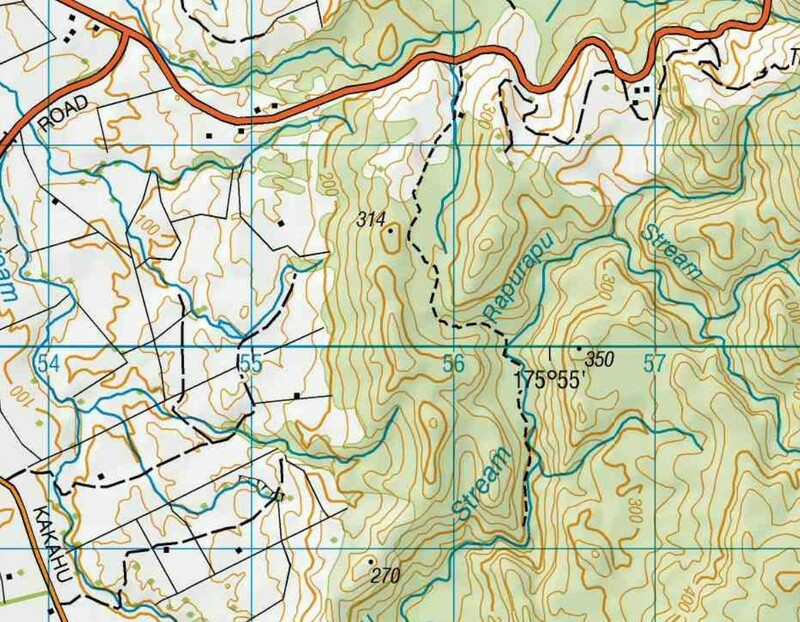 Excerpt of a LINZ topographic map of the area. The track was walked on November 29, 2015. 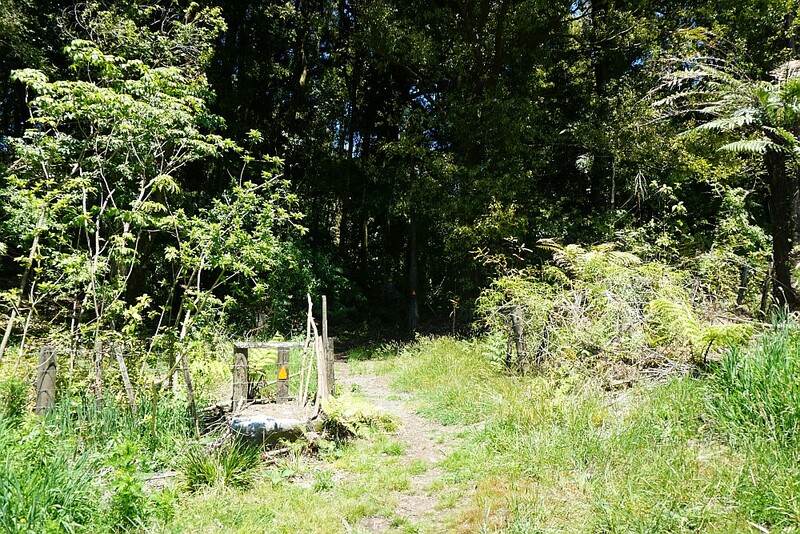 This entry was posted in Walks and tagged Kaimai Mamaku Forest Park, Kaimai Range, Kauri, Rapurapu, SH29, Tauranga on 2015-11-29 by nzartig.